3D Printer is not a machine that you cannot afford due to the price factor nowadays. The 3D printer has found applications in wide areas. Some of the prominent areas include education, rapid prototyping, production parts, manufacturing tools (gauges, fixtures, and templates), Anatomical models, customized housing and enclosures for biomedical equipment, sports equipment, consumer electronics, aerospace components, and heavy construction equipment. Currently, there are a number of vendors dealing in 3D printers. Along with the competition, the brands and the types of 3D printers have also increased and it becomes really difficult to pick the best one for you. For your convenience, I have picked the top performing 3D printers from the plethora of them. The all3dp site has listed Tiertime’s UP mini 2S 3D printer for beginners in their top ten list but here I have listed higher end of this model. The highlight of this printer is its ability to print large-sized models. The print area of this 3D printer is 255mm x 205mm x 205mm and this large envelope size also enhances the productivity since you can build a large number of smaller products in one go. The other noteworthy feature of the printer is auto-leveling that is done by 9-point calibration sequence. This 3D printer is Wi-Fi enabled and furthermore, multiple users can share and give printing command to the printer and you can also limit the user access through password-protect feature. Moreover, Tiertime 3D printer saves you from the blackout nightmare by remembering the last coordinates before the power outage. The printer will start working right from where it has left the job. This 3D printer is compatible to use with both Windows and Mac operating system. As required by beginner users, the printer is easy to set up and you can install filaments without any hassles. This 3D printer by Perfect Office supports both ABS/PLA filaments. Both the nozzle and the hotplate come with multiple temperature settings that allow the printer to print on a wide range of material types. As far as the applications are concerned, the printer is capable to print 3d objects in educational, manufacturing and medical industry. The printing size of the printer is 200mm x 200mm x 180 mm which clearly is not a large format surface. So it is recommended to print 3d Objects in smaller formats. The printer is equipped with a large LCD screen with keys to operate it. The best part of this 3D printer is that it is being sold directly by a manufacturer and offers a money back refund for a whopping 365 days. The selling point of this 3D printer is its stable printing surface. The surface does not warp even under the high-temperature conditions since it is constructed from aviation grade aluminum. Unlike other printers with plastic or wooden frames, this one from Qidi technology comes equipped with a robust and heat resistant metal frame. Although it comes with its own CAD software, it is fully compatible to work with other programs that include Simplify 3D and Replicator G. The 3D printer comes with turbofan for cooling and the printer works well on both ABS and PLA materials. The printer is reasonably priced and comes with a six month’s warranty. MakerGear is a renowned name in the 3D printer industry. It is made in USA and all the supporting components like extruder, steel frame, and wiring are of utmost quality. The cast aluminum used in the construction is CNC machined and offers industrial precision. Whether you are a student, designer, engineer or a DIY enthusiast, this M2 3D printer is designed for both professionals and weekend hobbyists. The M2 printer offers all the needed stability, reliability, ease of use and prompt customer support to accomplish your projects. The MakerGear printer supports a wide range of filaments and compatible with multiple CAD software and open software like slicer3, Simplify 3D and much more. This one from Qidi offers a print area of 150mmx 150mm x 160mm suitable for mid-sized models. The 3D printer is suitable for beginners since you can assemble the printer easily in a few minutes. Apart from the easy installation, the user interface is quite simple, easy to understand and operate. The other feature to look for in a best 3D printer is safety in operation and Qidi Tech Hi Smart truly matches this vital criterion. The other feature that is a testament to ease of operation is the option to remove the curved metal plate. The life of the extruder is long since the cabinet is cooled on all the four sides by cooling fans. With a large 3.5 Inches display and multiple filament support (PLA, TPU, carbon fiber, ABS, etc. ), it is one of the most recommended 3D printers of the current time. Bibo 3D printer is for those who value productivity at work. With two inbuilt extruders, you can create two models simultaneously with this printer and hence this is best for printing large volume models. The printer supports Wi-Fi printing and apart from Desktop computer, you can also give the printing command from the mobile phone. This 3D printer is fully capable of engraving on large types of material that include plastic, paper, wood and leather making it one of the versatile 3D printers to choose from. In case the filament gets exhausted, the printer pauses automatically and lets you change the filament to continue the operation. It comes with a six mm metal frame that is more robust compared to competitor’s plastic frames. With 2 color printing and multiple connectivity options, this printer is worth buying. Dremel launched this 3D printer exclusively for Education Niche. The printer is fully designed and equipped for classroom coaching. It comes with all the required lesson plans, filament, build plate, four hours of Development course and build tape. With a professional course, the instructors can teach the students to create their own prototypes. The students have the option to choose from three different colored filaments that include black, orange and blue. It has an outer glass plate that makes the operation quiet and safe. Furthermore, the printer comes bundled with cloud software and Dremel 3D slicer to manage printing. Moreover, you can also give printing commands through your own printing software that supports file extensions .gcode, .g3drem or .g. Although the Dremel 3D printer comes with one year warranty, you can avail lifetime Dremel customer support. The selling point of this 3D printer from Flashforge is its stability. To reduce the vibrations in surface plate, the Z-axis rod is built with heavy-duty material to keep the movement steady. To save the prints from external dirt, the whole chamber is covered with acrylic enclosure for insulation of the machine. The overall printing bed of the printer is 225mm x 145mm x 150mm and you can give command via SD card or USB cable. The printer is compatible to use with Windows, Linux and Mac OSX and the supported software are ReplicatorG, Simplify 3D and Flashprint. It supports a wide range of filaments that include PLA, Pearl, HIPS, TPE, ABS, EVA, Wood filled, Metal filled, ABS pro, PP, Elastic and PETG. Considering the flagship features, the 3D printer is reasonably priced. This 3D printer is suitable to print large sized models and prototypes with the printing bed of size 8.7” x 8.7” x 9.8”. This offers stable printing since the grooving of Y-rail is CNC machined. The main components of the machine are already assembled and you just need to tighten them on receiving it. The other noteworthy feature of this 3D printer is its ability to reach the required temperature of 110 degrees in quick time. The printer offers noiseless printing due to use of POM wheel. The 3D printer by Nidouillet has a wide range of applications ranging from home use, work, and education purpose. It comes with a safe power supply and fifty grams of the free testing filament. 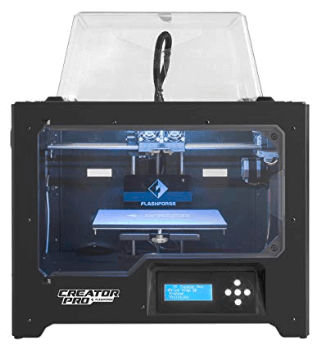 This is also one of the stable printers in this list of top 3D printers. It offers faster printing at a maximum speed of 300 mm per second. With a large 3.2 inches color touch screen, it offers a user-friendly interface to control the operations. It is equipped with a Lattice glass base that ensures easy removal of the model from the machine. The printing size of the printer is 250mm by 360 mm which is big enough to print large objects. With WiFi connectivity, you can easily communicate with the printer even through your mobile phone apart from giving printing commands from desktop PC. The printing bed should be perfectly leveled. Make sure the gap between the hotbed and the extruder is optimum (Not too much and neither too Less). The print bed should be absolutely clean. If not, clean it with Acetone. Since the filaments may get damaged by coming in contact with air, remember to keep these filaments in airtight containers. Another point to remember is that there are different settings for different types of filaments so do not run the printer at same settings for different filaments. With more and more advancement nowadays in the field of 3D printers, and the increasing number of competitors across the globe, the prices of 3D printers are already coming down. This has really paved the way for printer enthusiasts to buy them and get hands on experience on them. It has a wide range of applications as you might have read above and one more concluding point that I would like to make is that you should never buy an old 3D printer due to damaged parts or inappropriate leveling and other settings. So do share your experience with 3D printers.